Trisha Hardgrove’s pastured chicken project at Restoration Farm is a complete success as far as we in the de Cuba Romero household are concerned. These birds are so beautiful to work with, so wonderfully textured, so flavorful, that they almost cook themselves. Going back to conventional factory-raised chicken is pretty much out of the question now, but even organic supermarket chicken cannot compare. Having said that, we can all use a little enhancement to highlight our best features, and this simple roasting recipe, inspired by The Barefoot Contessa, is just the thing. 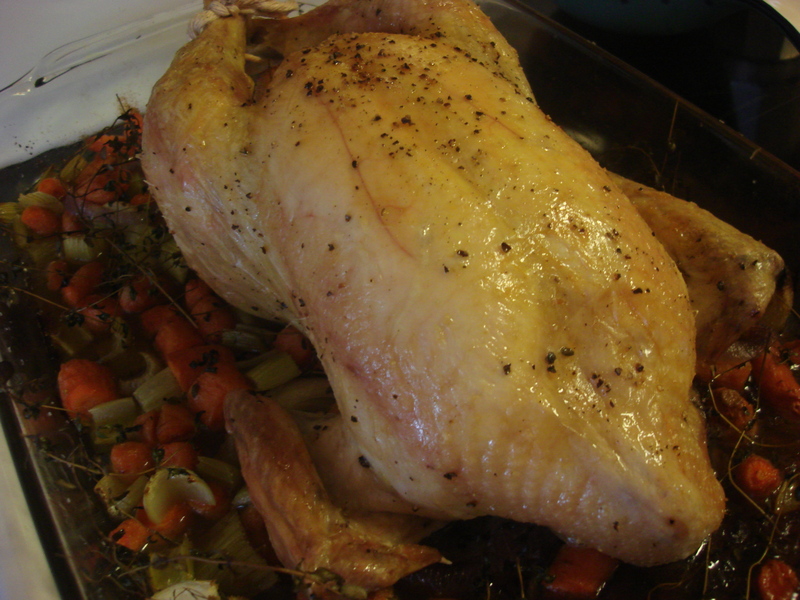 The result was a juicy, tender bird and juicy, tender vegetables, infused with — but not overwhelmed by — lemon, thyme and garlic. The original recipe called for the bird to be slathered with butter, but here we prefer olive oil. Mind you, we did NOT get a crispy skin, which may be what you are looking for. In that case, substitute same amount of melted butter. She also uses a fennel bulb where we use celery – again, just personal preference. This was a meal my dad, Pedro, and I did together – it is thanks to him that we were fearless with the salt. You really do want that much. We did not, however, put any additional salt on the vegetables and they didn’t need it. You can always finish them with salt at table. The amount of thyme may seem a lot, but it really flavors the chicken and the vegetables. I am fortunate to have a bumper crop of French thyme in my container herb garden, so it was no problem for us. If you are buying at the store, you will want the equivalent of two fat fistfuls of sprigs for the whole recipe. Preheat oven to 425°F. Remove chicken giblets. Rinse the chicken inside and out, remove excess fat and pin feathers and pat dry. Use the 2 Tbs salt and 1 Tbs pepper to salt and pepper the inside of the bird, then stuff the cavity with the thyme, lemon and garlic. Brush the outside of the chicken with 2 Tbs olive oil and sprinkle with the remaining salt and pepper. Tie the legs together with kitchen string and tuck the wings under the body. 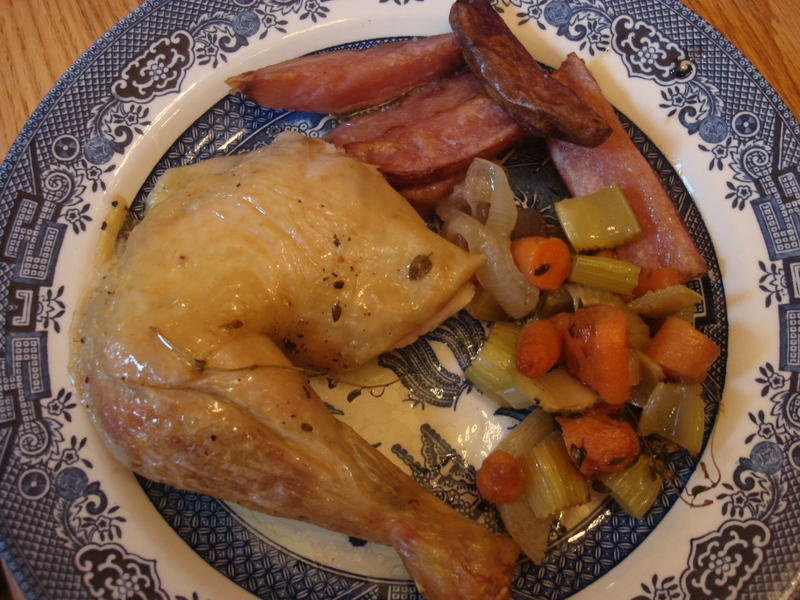 Place the onions, carrots and celery in the roasting pan and toss with the remaining olive oil and 20 sprigs of thyme. Place the chicken, breast side up, on top of the vegetables. Roast the chicken for 1.5 hours (to an internal temperature of 165° or until the juices run clear when you stick a knife between leg and thigh and the joints move freely in the sockets). Remove chicken and vegetables from roasting pan, arrange on a platter and let rest under a loose foil cover for 20 minutes before serving. In the spirit of efficacy and energy-efficiency, we simultaneously roasted beets for a future salad and oven-fried potatoes (recipe to come). For the beets, simply cut off beet greens to an inch above the beet, wash and dry, wrap loosely in foil and stick in the oven with the bird. The beets will be done when the chicken is done. You can easily peel them and serve them with the chicken, or save them for something else in the next day or two. Looks lovely. Lemon and thyme are my favourite flavourings for chicken, delicious. You should try using lemon thyme. Wha an excellent idea! Thanks! I love crispy chicken skin, so maybe it’s good it wasn’t crisp. I would’ve eaten it all. It still looks great to me.